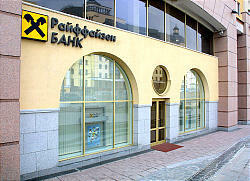 Raiffeisenbank leads foreign banks in Russia with more than $208 million in deposits. In the higher end of Russian retail banking, a well-known name may be more important than high returns. While Sberbank remains the general public's popular choice for deposits, wealthier Russians are turning more and more to foreign banks. A newcomer to the local market, Small Business Credit Bank, or KMB, an arm of the European Bank for Reconstruction and Development, has been increasing its activity and now offers interest of around 20 percent, much higher than most other foreign banks. KMB's local business, however, pales in comparison to Raiffeisenbank, a local stalwart that has six times as many clients though offering half the interest rate. "More Russians are now looking for confidence, not for high returns, breaking the myth that they only care about easy money," said Mikhail Matovnikov, deputy director general with Interfax Rating Agency. KMB has boosted returns on ruble deposits in an effort to attract more individual clients, raising rates by a further 2 percent to 3 percent Monday to between 14 percent and 20 percent on minimum deposits of 3,000 rubles ($96) and 21 percent on annual deposits exceeding 3 million rubles. Aggressive strategy and high rates helped KMB boost retail deposits 600 percent to $17 million last year, with the number of individual clients growing 10 times over that period to more than 8,000 as of March 1. But this is only a fraction of the retail money accumulated by Raiffeisenbank. Despite very low interest rates and quite high minimal deposit requirements, the Austrian bank is the leader among foreign banks in terms of individual deposits, with more than $208 million on its individual deposit accounts as of March 1 and more than 23,000 clients, the bank said. Meanwhile, the International Moscow Bank, which last year merged with Bank Austria, Raiffeisenbank's main competitor, is offering 15.5 percent for annual deposits ranging from 50,000 to 500,000 rubles. The bank sets a maximum rate of 17.5 percent for amounts exceeding the ruble equivalent of $32,000. The bank, however, has attracted $159 million in deposits, $50 million less than Raiffeisenbank, despite the fact that Raiffeisenbank pays only 9 percent on six-month ruble deposits, with a minimum deposit of $3,000. For dollar deposits, you will not get more than 3.5 percent at Raiffeisen, while KMB sets its maximum rate at 7.5 percent. "Raiffeisen has managed to build an excellent brand in the market, having started from scratch several years ago," Matovnikov said. Even though it is not competitive in terms of financial attractiveness, he said, it has a big advantage: confidence.